I've gotten a few email asking "How can I help you in Honduras?" 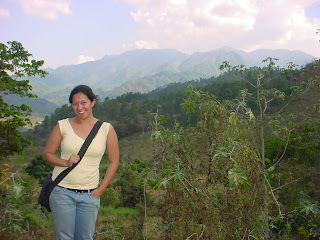 My name is Kathryn Fahey and I am a Peace Corps Volunteer working in San Ramón, Lempira, Honduras. My project is youth development and I work at the grade school. I am looking to start a collection of books in Spanish for the students at the grade school before I leave in November 2007. 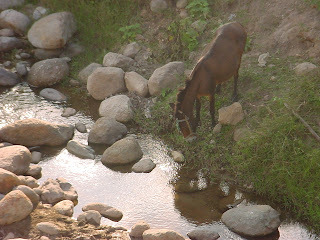 San Ramon, Lempira is a town of 550 in western Honduras. Most families earn their living through the cultivation of coffee, corn and beans. Escuela Lempira has a student population just under 200 but is growing each year. 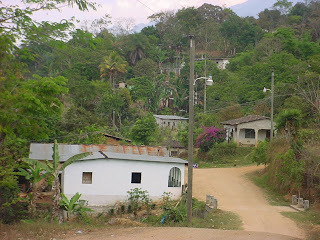 Students from nearby towns come to Escuela Lempira because of the experience of the teachers. While these students do not have much in terms of learning resources, they still have a strong desire to learn. I feel that by bringing books to this school will help the students improve their reading skills and supplement their learning. The teachers can use the books for a story hour and use them in their classes. Please note that these kids have little exposure to English so that is why I am asking for only books in Spanish. Even one book will make a difference in helping create a new library for these kids. Like always, I am not begging for stuff. This is just if you want to help out and have a little extra money to send a book my way. Cheque. Morning block: Make breakfast…and since I have more time, I can make a complex breakfast that will take several steps. I make a grilled onion and tomato omelet with pancakes. From prep to clean up and eating time, almost 2 hours. Late morning block: Shower and coat self in sunblock because I’m going to go to the river to chill. Leave for river knowing that the walk will take almost an hour. Early afternoon block: At river, lay out in sun, ignore catcalls and read magazines. Later, splash around in the water like a 6 year old when annoying catcallers aren’t there. Late afternoon block: Make late lunch…again, since there’s more time, I make pizza from scratch. Take 2nd shower and read more magazines. Early evening block: Watch Mexican soccer on TV because there is nothing else of interest on. Give up and watch Bend it Like Beckham again. Late evening block: Send text messages to other PCVs and read more magazines until I feel it is acceptably late enough to go to sleep (9 pm). It is hard at times because I am reaching that point in my service where all I can think about is how it’s going to end. I can’t countdown quite yet but it’s looming. Then there are those times when I absolutely love said days where no one is knocking on my door, asking me for food, to take their picture or just want to watch TV. When I can read 6 magazines in one sitting and I look at the clock once during the day to see that it’s already time for bed. Those are the days I am going to miss the most once I get back to life in the U.S. Like I said, I love and hate being alone. After spending the day at Nicaragua's cleanest body of water (Laguna de Apoyo), we decided to go out and treat ourselves to a special dinner. We went to this spot called Jimmy's Three Fingers BBQ (the owner really does have three fingers in the 'shocker' way) and everything sounded appetizing. Rosemary Garlic Chicken, Pork Tenderloin, Baby Back Ribs....yum. I ordered a Grilled Red Snapper which came with a house salad, which by itself was spectacular (I do miss veggies). The fish filets were huge and delicious. It was pricy for a PCV but in the U.S., I would never pay $5.50 for the fab fish that I ate. After dinner, we went and had gelato and sat at the shore of Lake Nicaragua and just chilled. It was a cool night and fabulous outside. Sitting at the shore on the rocks made me think of home and how much I missed it, even though I didn't feel too homesick. It was a nice balance to a great night. Having high speed internet is a wonderful thing...so I need to take advantage of it to show off more of my life as a PCV. How will I be able to return to a life without a mountain backdrop? 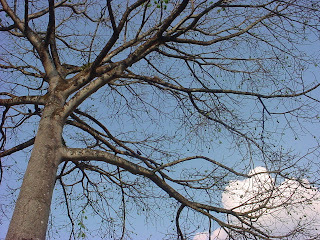 Cool looking tree that was impossible to catch in one frame. I have to thank my friend Crystal for taking these pictures when she came up to visit me. It's really cool when other people visit because they get to appreciate the things that you've taken for granted. You also get to see your town through their eyes...which is cheque leque. 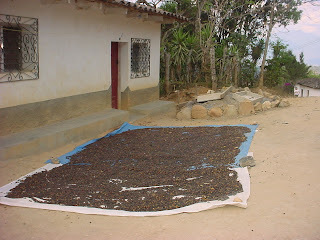 My neighbors are drying out their coffee cherries in front of their house. I think San Ramon is a really cute town. I took Crystal and Simon down to the river by San Ramon but it's a bit of a walk. 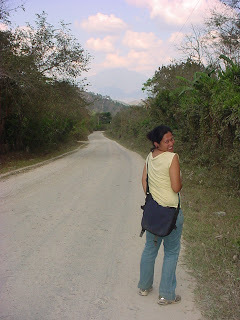 This is the main road that takes you to Santa Rosa, the town where I purchase 90 % of my groceries. I'm spending the week in Nicaragua with friends Crystal, Simon and Delfo. We arrived late in the afternoon yesterday and it has already been interesting. First, we ask a cab in Tegucigalpa how much it would cost to take us to the bus station for the buses headed south and the cabbie simply replies, "I don't want to drive there." Alright then. A minute later, we do find a cab driver that will take us there, and after a quick stop to use the bathroom at McDonalds's, we get to the bus stop and see a mass of people trying to get on one of the buses headed south. It's insane. The bus was already packed but more people kept trying to board the bus and squeeze their way on. People that were on the bus were holding seats for their family and the people that were outside were passing their kids through the bus windows to make sure they got on. After about 2 minutes of pushing, we realized that we weren't going to get on the bus, so we walked over to another bus that was headed south but didn't really stop for anyone. A guy tried to get on while it was slowly moving but was thrown off by the assistant. "Make a line! Make a line!" Yeah right, lines don't exist here. More shoving to try and get on the bus. Crystal was the closest to the front, so she does her best to position herself to get on the bus, but it is difficult because so many people are just shoving their way on. I'm right behind her and we're both getting pushed and grabbed but neither of us really care because our main focus is to get on that bus. Crystal was at the stairs of the bus and this guy shoves his kids under her arm to get them on the bus. Not just 2 kids, but 5. Then he pushes in front of her to get on too. "Excuse me." Now you try to be polite after shoving your kids past us? Finally Crystal gets on and I'm right behind her, though I'm pretty sure I flashed a few people with the top that I was wearing just because I kept getting shoved. We get to the back of the bus and save seats for Simon and Delfo. Simon gets on without a problem but the driver didn't want to let Delfo on because the bus was already full....after Simon pleaded with the driver by telling him that Delfo didn't speak any Spanish and was scared (lies), the driver agreed to let Delfo on and we were on our way. A stressful way to leave Honduras.